Since our last post, identifying the ways each of the remaining 10 A.L. teams vying for the final wildcard spot could win that said wildcard spot; a mere five days ago, we have seen seven teams fade off into obscurity and a tightening three horse race. Given our probabilities for each team, this scenario was widely accepted as the Tigers and White Sox each immediately fell out. The Twins splitting series with the Indians doomed the Tribe, and the Red Sox sweep of Baltimore KO’d the birds. Despite all these minor squabbles between A.L. teams, nothing is more apparent that the seven game win streak the Los Angeles Angels put together to briefly gain the A.L. Wild Card lead; only to eventually relinquish the lead back to the Houston Astros one day later after a four error 8-7 loss to the Oakland Athletics. It should be noted that the Astros once again found their composure after dispatching the Seattle Mariners in a big series to help reclaim their A.L. Wild Card spot. In the meanwhile, the Minnesota Twins seem to hang in there, still a slim 1.5 games out with 4 to go. For the remaining games, we have merely a total of 11 games that matter; or 2048 possible outcomes. If we include the New York Yankees’ remaining games (since they haven’t clinched anything yet), this balloons the possible outcomes to 32,768 outcomes. We can either count all possible outcomes or simulate the possible outcomes using our trusty random number generator. In the end, the results are nearly identical. 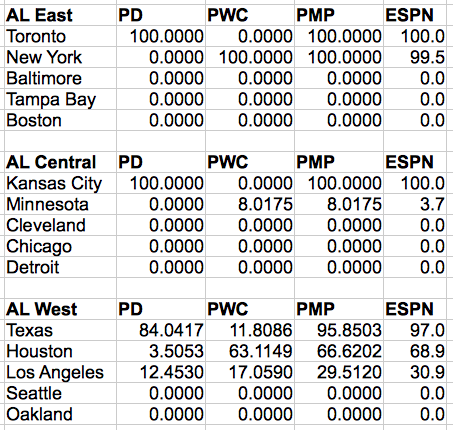 Probabilities of winning the division (PD), winning a wild card spot (PWC), and making the playoffs (PMP) for the American League East. Yankees Guaranteed a Spot Already? Yankees don’t make the playoffs if two of the remaining three teams pass them. Since these can be broken into disjoint events, we can look at all three possible situations. Situation One (and Done): Angels and Astros. In order for this situation to occur, the Angels need to recover a three game deficit to the Yankees. That is, the Yankees have to win 0 or 1 games. The probability of this occurring is 24.15%. That’s only one part of the equation. The other part is that the Angels need to win three or more games. In fact, they need to win three if the Yankees never win. Otherwise, the Halos have to sweep Texas. The probability of a sweep is 15.91%. Similarly, the probability of taking three from Texas is 58.78%. So how does this break down? Yankees being swept and the Angels winning three or more is a 3.06% chance. To complete this probability, we have to look at the Astros. They must win at least two games of their remaining three against Arizona. Based on their history against N.L. teams and Arizona’s history against A.L. teams this season, we get the probability that the Astros wins two or more games to be 65.56%. Thus the probability that the Yankees do not clinch the Wild Card spot is 2.01%. Now, this still ends in a tie and goes to a playoff. In this case, the most likely scenario is a Yankees-Angels showdown for the final spot. In this case, the Yankees effectively have a slight edge to win; they are 4-2 against the Angels. This reduces down the probability of missing the playoffs to being less than 1%. In our simulations, we take the home team in a one game playoff as the likely winner, which effectively reduces this number to zero. As you see the probability of the Yankees not making the playoffs disappear with the two legitimate contenders, we won’t go further to show how the Twins get in over the Yankees. Who Gets the Last Spot? Right now, it’s the Astros in complete control of their destiny. They hold a half game lead with a win in pocket over the Angels. The Rangers-Angels series is going to be a big series for the fact that if the Angels sweep the Rangers, the Rangers lose the division and become a wild card contender. There is a 15.91% chance of this happening. It’s not insignificant. Most likely we will see a two game split or the Angels take three of four. Or, due to small numbers, we may see Texas take control of a series they have shown to be vulnerable in (10-5 against the Angels this year). The Twins may have an 8% chance, but they have to win against Kansas City and win 2-3 of their final four games. However, the most likely scenario will be Houston versus New York for the wild card game, with a right to play the Toronto Blue Jays. However, anything is certainly possible. The Rangers showed us this earlier this month to wrestle control of the A.L. West from Houston. The Angels and Astros have shown us with the winning streaks over the past week. Whatever will happen, this will be an exciting finish to the American League regular season.